CloudLinux Resources Control - Knowledgebase - ControlVM Sdn. Bhd. CloudLinux is an operating system that specially designed for shared hosting environment, which consists of user resources usage control. Our in-house cloud infrastructure are purposely built and optimized for daily business use. Coupled with CloudLinux, it allow our web hosting services run in stable, secure and individual account isolated environment (CageFS - Visit HERE for more information). Your website no longer affected by noisy neighbors who possibly use up entire server resources that eventually bring down your website in the same machine. 100 384 5 50,000 n.a. Cloud 30G 100 512 5 80,000 n.a. Cloud 40G 110 512 6 100,000 n.a. Cloud 50G 120 768 7 100,000 n.a. Biz Value 130 1024 8 130,000 n.a. CloudBiz 1 140 1280 8 150,000 n.a. CloudBiz 2 150 1536 10 200,000 n.a. CloudBiz 3 200 2048 15 250,000 n.a. * For server stability, we reserved the rights to change above allocated resources value without prior notice. Percentage of CPU power allocated. Eg. suppose one CPU core = 2GHz, with CPU power of 50% means you can use up to 1GHz CPU power to run your website. 100% means full one core or 2GHz. 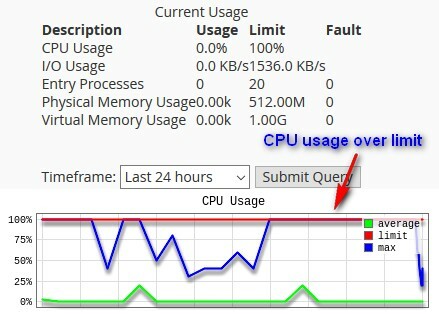 If your CPU usage go beyond the limit, your website will slow down or stop working. HOWEVER, other tenant's website remain normal. Amount of memory that allocated for each account. If your memory usage go beyond the limit, visitors to your site will receive error 500 or error 503 message in their web browser. This parameter is the restriction of data throughput for each hosting account. When website data throughput go beyond the limit, your website will still working but at slower rate until the active data flow level lower than the limit set. 10sec burst through the limit is enabled for each account. This is additional feature for reseller under our Elastic Cloud Web Hosting plans, where reseller able to adjust the resources package for each of their users account. You can upgrade your current reseller plan (which going to phase out soon) to our ESCloud plan. MY WEBSITE HITS THE LIMITS! When your website hits the pre-allocated resources limit based on above service plans, you will observed abnormal respond of your website. 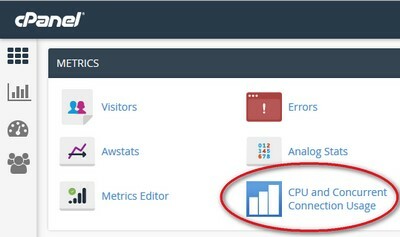 You can always login to your cPanel account and look for Metrics >> CPU & Concurrent Connection Usage. You can view details of resources usage in graphical form as well as raw data for each interval. 1) Check your website content to see any poorly written scripts. 2) Repair / optimize your database. 3) Disable plugins or features that causes over usage of resources. 4) Order new cloud hosting plan or Elastic Web Hosting plan and split your domain(s) to different account (Since resources limit is per cPanel account basis). You can also upgrade to Reseller Hosting for the same purpose. 5) Upgrade to higher plan based on your website resources usage historical data. 6) Move to high level - Cloud VM or VPS. How to activate Redis cache in Wordpress?